SoLIM (Soil Land Inference Model) is a new technology for soil mapping based on recent developments in geographic information science (GISc), artificial intelligence (AI), and information representation theory. SoLIM was designed to improve the methods, efficiency and accuracy of the soil survey. An over-arching goal is to free survey soil scientists from burdensome cartographic tasks and thereby make better use of their extensive understanding of soil-landscape relations and soil-forming processes. Case studies have shown that SoLIM could be faster and more accurate than traditional survey methods, that it generates a range of products not available using the traditional approach, and that it can be employed in a production mode of soil surveying. The SoLIM Project is a research endeavor originally funded by five-year grant from USDA's Natural Resources Conservation Service. The principal investigators are Profs. 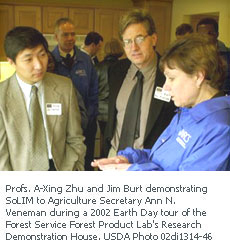 A-Xing Zhu and Jim Burt of the University of Wisconsin-Madison. Please also visit the Publications page.